Hey so guess what. Ballast Point is coming out with some new beers. See anything, uh, funny about the lineup? Let's look at it again. Yeah, it's basically all their popular beers with new fruit adjuncts in them. The Grapefruit Sculpin worked out so well, it seems, that Ballast Point is going to the well again. You can't blame them, even if you think the beer tastes too much like a shandy for it to be in your regular rotation. And if you think that this is just a part of today's beer world -- you're right. More and more non-ciders every month have a fruit in the title of the beer. 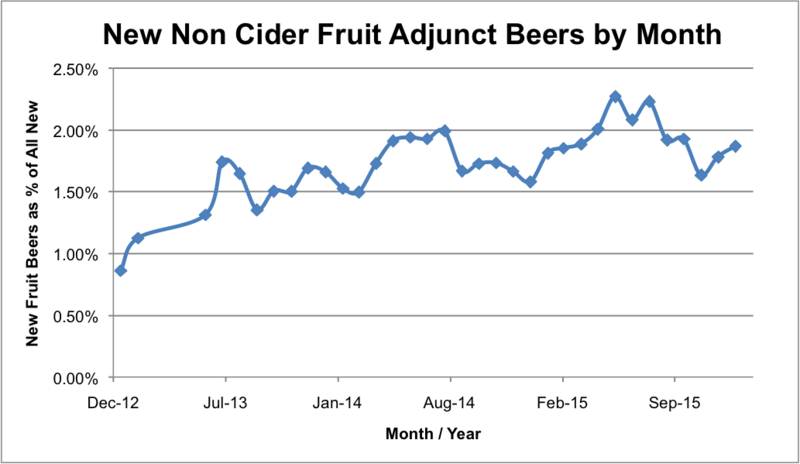 Expressed here as a percentage of all new beers, check out the rise of the Fruit Adjunct. The title of this post is obviously facetious. We shouldn't be worried that two percent of our beers are now fruit-laden. It'll be okay. But that two percent is up from 1.5% is up from 1%, and if you look closer, it looks like more is on the way. Those Ballast Point beers are not out yet, but they wouldn't move the needle by themselves. Look instead at the rise and fall of the graph -- fruit adjunct beers are a summer thing. It may just be a naming convention thing -- there's apricot in Black Butte XXVII, after all, but they didn't name it APRICOT BLACK BUTTE -- but it does look like this summer will be the summer of Your Favorite IPA + [insert fruit]. As a beer drinker, I think it'll be okay. I like fruity, juicy IPAs after all. But I prefer the fruit to come from the hops than, you know, actual fruit juice injected into the beer. As a German, though, I've seen this before. In Munich, they have Apfelwein, a thin cider-like beer that many residents mix with Fantas of all flavors. And Berliner Weisses? It's not uncommon to have an array of Italian soda syrups on hand at the bar. Inject your own adjunct! So this isn't new in an historical sense, even to the birthplace of beer, where no adjuncts are allowed by the Rheinheitsgebot. But in a current sense, yes, we are seeing more fruit adjuncts in our beers. If that's fun or foul, that's up to you (and your tastebuds) to decide.